There is a lot conversation as to the where and why of how the Al-Jiwah and Melek Taus have become a permeation in Satanism. The modern concept of Satanism was introduced to us by Anton Lavey. Within the Satanic Rituals, written by Lavey, is the Al-Jiwah and ritual involving shaving your head. As Satanism became more fractured, you see a major split at the beginning of the year 2ooo common era. This is when Diane Vera codified the term Theistic Satanism and Cathedral of the Black Goat codified Tradition/Orthodox Satanism. Around the same time Venus Satanis, hit the Satanism with the concept of Spiritual Satanism. The Al-Jiwah was a common thread for all of them. Since the book is suppose to be written from Creator as Melek Taus being left to mankind as their guide. This is a key book for most of religious Satanism. Where did this Al-Jiwah come from and why would Anton Lavey even begin use such a text? In 1919 a book was written by Isya Joseph, titled Devil Worship (The Sacred Books and Traditions of the Yezidiz). In my opinion, Lavey made an attempt to secure knowledge from different cultures that where involved in Devil Worship aka dark gods. This is why within the Satanic Rituals book you find French, German, Russian, Yezidi, and even Lovecraftian rituals. Different rituals for different reason, and the pursuant of knowledge from many different sources. This shows opposition from the Christian stance of only one source. As far as the Abrahamic Religions are concerned Melek Taus can be seen as Lucifer or Satan. God ordered Tawûsê Melek not to bow to other beings. Then God created the other archangels and ordered them to bring him dust (Ax) from the Earth (Erd) and build the body of Adam. Then God gave life to Adam from his own breath and instructed all archangels to bow to Adam. The archangels obeyed except for Tawûsê Melek. In answer to God, Tawûsê Melek replied, “How can I submit to another being! I am from your illumination while Adam is made of dust.” Then God praised him and made him the leader of all angels and his deputy on the Earth. (This likely furthers what some see as a connection to the Islamic Shaytan, as according to the Quran he too refused to bow to Adam at God’s command, though in this case it is seen as being a sign of Shaytan’s sinful pride.) Hence the Yazidis believe that Tawûsê Melek is the representative of God on the face of the Earth, and comes down to the Earth on the first Wednesday of Nisan (April). Yazidis hold that God created Tawûsê Melek on this day, and celebrate it as New Year’s Day. Yazidis argue that the order to bow to Adam was only a test for Tawûsê Melek, since if God commands anything then it must happen. (Bibe, dibe). In other words, God could have made him submit to Adam, but gave Tawûsê Melek the choice as a test. They believe that their respect and praise for Tawûsê Melek is a way to acknowledge his majestic and sublime nature. This idea is called “Knowledge of the Sublime” (Zanista Ciwaniyê). Sheikh Adî has observed the story of Tawûsê Melek and believed in him. This is a small part of the Yazidiz religion and mythology. How do mythology and religion fit together? Religion and mythology differ but have overlapping aspects. Both terms refer to systems of concepts that are of high importance to a certain community, making statements concerning the supernatural or sacred. Generally, mythology is considered one component or aspect of religion. Religion is the broader term: besides mythological aspects, it includes aspects of ritual, morality, theology, and mystical experience. A given mythology is almost always associated with a certain religion such as Greek mythology with Ancient Greek religion. Disconnected from its religious system, a myth may lose its immediate relevance to the community and evolve—away from sacred importance—into a legend or folktale. “Will you bow down before man, whom I have created? Will you give way to those with a soul?” Hormazd begged Melek Taus. Melek Taus turned to me, then back to Hormazd and responded, “I am a divine child created from your sorrow and the doubt that is Father Ahriman. I am the smokeless flame of compassion and wisdom. Only through sorrow is wisdom attained; only through wisdom is compassion understood. You seek enslavement upon these souls; Father Ahriman seeks to free them through destruction. I am both divine and damned, and I choose compassion for the souls of man. Melek Taus remains intact as far as the Yazidiz see him as the highest arch-angel. This is shown by Melek Taus starting out as an eagle or Faravahar. The winged symbol now associated with Zoroastrianism known as the Faravahar has its origins in an older symbol of a winged disk without a human figure within it. This older symbol, more than 4000 years old and found in both Egypt and Mesopotamia, was commonly associated with the sun and deities strongly connected with the sun. It also represented power, particularly divine power, and it was used to reinforce the concept of god-kings and divinely appointed rulers. These are things that the RHP don’t want you to have. This how they define the Gawd they worship. This is how we define ourselves and what we are working towards in the Ahrimanic Faith. When we say that Melek Taus is our Guardian and Guide, he is just as he is in Yazidiz. Melek Taus is left in control of the physical world until the return of Angra Mainyu is to come. 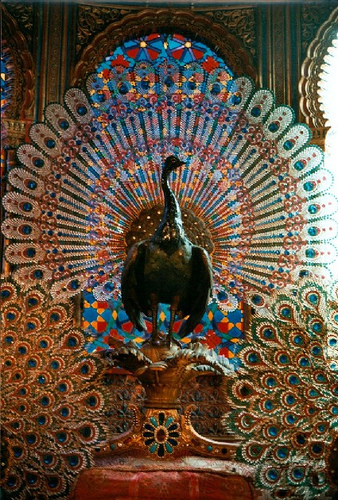 We teach our members how use the concepts of the Lion and Serpent in the exterior world, they are also taught the concepts of the Peacock within themselves and within the circle of those closest to them. This entry was posted in Church of Ahriman, Left Hand Path, Occult, Zoroastrianism and tagged Adam B Daniels, Ahriman, Ahrimanism, Angra Mainyu, Bible of Corruption, Church of Ahriman, Melek Taus, Okc Satanism, Religion and Myth, Satanism, spiritual satanism, Theistic Satanism, Traditional Ahrimanism, traditional satanism, Vedic Hinduism, Yazidiz, Zoroastrianism. Bookmark the permalink. What’s up to every body, it’s my first pay a quick visit of this blog; this web site contains awesome and truly good stuff designed for readers. Anyway, in an effort to understand how the Yezidi belief system permeated into Satanism ( i like the way you put that), you should look at other ancient civilizations deities in correlation to your average satanist’s beliefs on demons. There are a lot of common references and if you put it all together, it really builds an interesting story that really adds an interesting twist when you take a look at literally any other spiritual belief system today. Useful info. Fortunate me I found your site accidentally, and I’m stunned why this accident did not took place earlier! I bookmarked it. Genuinely exceptionally neat website. Rather pleasant to browse and fairly much intriguing information. Undoubtedly year consists of not but appear back and greet.